Eclipse JFace Tutorial. This tutorial gives a overview about the Eclipse JFace API for developing user interfaces. 1. What is Eclipse JFace? Eclipse JFace is a set of plug-ins based upon the user interface toolkit SWT. JFace provides classes and frameworks which simplify common SWT use cases. JFace does not hide the SWT API; therefore, SWT knowledge is still required. JFace provides the viewers framework, which simplifies the mapping of a data model to a visual representation. For example, you find viewers for ComboBoxes, Tables and Trees. JFace also provides helper classes to effectively manage your system resources, like colors, images and fonts. In addition JFace provides support for handling preferences, preference pages, wizards and dialogs. It also contains functionality to support icon decorations and user-input help for SWT controls. JFace Data Binding is a framework which connects properties of objects. It is typically used to synchronize fields of the user interface with properties of model objects and allows you to include validation and conversion in this synchronization process. SWT is based on the native widgets of the OS. Whenever an SWT widget is allocated, a corresponding OS specific widget is created. The Java garbage collector cannot automatically clean-up these OS-specific widget references. Fortunately all widgets which are created based on a parent widget are automatically disposed when the parent Composite is disposed. If you develop Eclipse plug-ins, the Composite of a part is automatically disposed once the part is closed. Therefore, these SWT widgets are handled automatically in Eclipse plug-in projects. This rule does not apply for colors, fonts and images, as these may be reused in other places. For this reason, they need to be explicitly disposed. JFace provides the ResourceManager and its derived classes for managing such resources automatically. An instance of the LocalResourceManager class is created with a reference to a Control. If this Control is disposed, the resources created by the LocalResourceManager are also disposed. The createImage() method expects an ImageDescriptor class. In case you do not have an instance of Control, the`LocalResourceManager` also provides another constructor. In case you do not pass a Control, to the LocalResourceManager. You have to dispose the ResourceManager yourself. You should use always use a JFace ResouceManager if possible. This avoids problems with system resources or even a "No more handles" SWTException. To create disabled images you can create an ImageDescriptor with the org.eclipse.jface.resource.ImageDescriptor.createWithFlags(ImageDescriptor, SWT.IMAGE_DISABLE). Afterwards use the LocalResourceManager to create the Image from this new descriptor. The ControlDecoration class allows you to place image decorations on SWT controls to show additional information about the control. These decorations can also have a description text which is displayed once the user places the mouse over them. During the layout of your screen you need to make sure that enough space is available to display these decorations. The following code snippet shows how to create ControlDecoration and how to set a description and an icon to it. You can hide and show the decoration via the corresponding methods as demonstrated in the following code snippet. 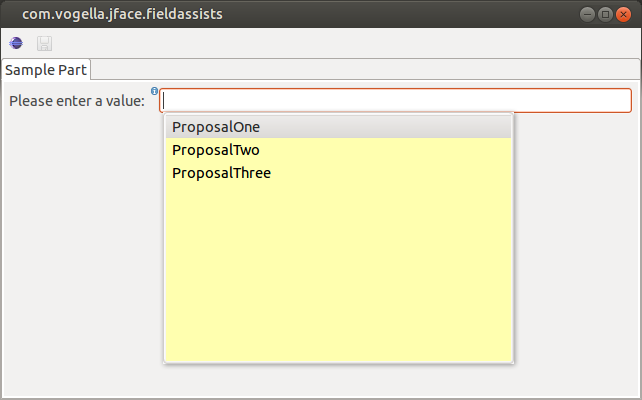 Eclipse allows to define assistance for user input for widgets. The org.eclipse.jface.fieldassist package provides this functionality. For example, you can define input help for a text field or a combo box so that the user gets possible input values presented. The ContentProposalAdapter is responsible for providing the possible input values. You can also define keys which should activate this content proposal. In the following example the content proposal should get activated via certain keys ("." and "#") as well as the Ctrl+Space key combination. The following code demonstrates the usage of the field assistance functionality. It also uses the ControlDecoration class. If used the result should look similar to the following. The JFace viewer framework allows you to display a domain model in a standard SWT widget like list, combo, tree or table without converting the domain model beforehand. A viewer allows you to set a content provider which provides the data for the viewer. The content provider makes no assumption about the presentation of the data model. You can also assign at least one label provider to a viewer. The label provider defines how the data from the model will be displayed in the viewer. JFace provides several standard viewer implementations. These viewers are part of the org.eclipse.jface.viewers package. The following list contains the most important ones. The related interfaces for defining a content provider are described in the following table. Used for the List-, Combo- and TableViewer. JFace provides a default implementation for Collections and Arrays with the ArrayContentProvider class. Because the ArrayContentProvider class does not store any data, it is possible to share an instance with several viewers. To get a shared instance use the ArrayContentProvider.getInstance() method. Used for the TreeViewer class. Has additional methods to determine the children and the parents of the elements. Important standard label providers are listed in the following table. Used for lists and trees, can return an icon and a label per element. Used for tables. Defines a label provider per column. The ComboViewer class simplifies the implementation of a SWT Combo (Drop-down box). Assume the folloiwng data model. The following example snippet shows you how you could use this given data model in a ComboViewer. The listener is is notified whenever the selection of the viewer changes. You can get and set selections using Java objects based on your domain model. In this exercise you learn how to add field assist to input boxes. In this exercise you add field assistance functionality to a Text widget. This allows the user to select predefined cities. Use the following example code for this, this code also adds control decorations to the text field. In this exercise you implement field assists for a combo box. Let the user enter a system path and fill the proposals with the directories contained in the given path. The AutoCompleteField class that we’re using comes with default settings that can’t be changed. This includes filtering being activated. AutoCompleteField doesn’t provide a way to change this but since it’s only doing some initial wiring we can implement it ourselves without too much unnecessary duplication. The correct place to change the filter behavior is in the IContentProposalProvider#getProposals() method. The following code shows an implementation of IContentProposalsProvider that takes the caret position into consideration when applying the filter. The input /b|in ("|" marks the caret position) should show proposals for all folders starting with a b. Review the https://github.com/vogella/eclipse.platform.ui/blob/master/examples/org.eclipse.jface.snippets/Eclipse%20JFace%20Snippets/org/eclipse/jface/snippets/viewers/Snippet060TextCellEditorWithContentProposal.java snippet and integrate table editing with content proposals into a new view.